The demand for parking at the West Side Market and in Ohio City in general is at an all-time high and continuing to grow; and the City of Cleveland is taking steps to improve parking amenities and increase the number of parking spaces available by implementing a consolidation plan that will improve and merge Lots A and B behind the West Side Market. To date, the City of Cleveland has secured $2.6 million of the total estimated project cost of 3.3 million through general obligation bonds and grants. The City has hired consulting firm Behnke and Associates to begin design work for the consolidated on-grade parking lot and create the appropriate construction documents for bidding while the remaining $700,000 is being secured. 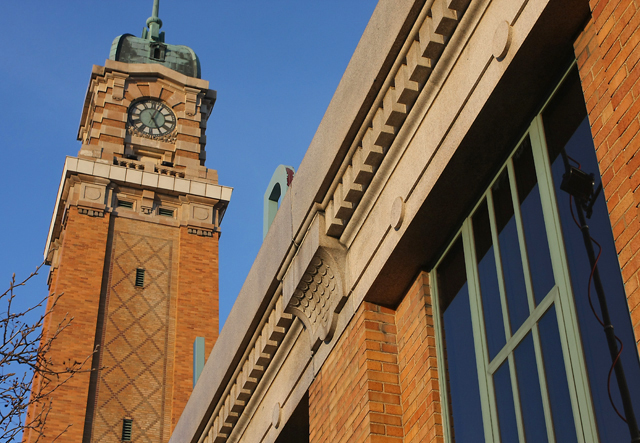 During the design process, the City will be scheduling various meetings with the West Side Market tenants, Ohio City Incorporated, and Ohio City vendors and stakeholders to collect input on transitioning to paid parking for visitors and shoppers, an option the City is strongly considering. Bidding is expected to occur in the late spring or early summer of 2015 with construction possibly beginning as early as the fall of 2015. Don’t increase parking. Increase transit options and frequency instead. West side market vendors don’t care how customers get there. They just want customers. I’d rather see mix-use developments built on the parking lots. I think paying for parking is a great thing though. There really isn’t such thing as free parking. Hopefully more people will ride their bikes there and/or take mass transit. Yeah I agree. It is inequitable to ask low-income residents of the city of Cleveland who don’t drive to pay for free parking for richer people who do and then charge the low income residents $2.25 to ride the bus to the same spot. Not too sure how you misguided Leftists “Patrick” and “Angie Schmitt” suggest riding your bicycles in Winter (this is Cleveland, Ohio and not Tucson, AZ) or charging customers to park in a city lot that is already paid for by City Taxes will be good for increased traffic to the Market…but let’s leave logic out of this conversation and stick strictly with emotion and feel-good comments and observations. Michael Cox really does not want to be bothered by the lack of management of the West Side Market. Director Cox is currently courting private developers who want to buy the property and build expensive town homes that overlook Collision Bend and the Flats along the far edge of the West Side Market parking lot–small problem though. St. Emeric’s Church which was on the short list for closure by the Cleveland Diocese is standing in the way of this master plan. It was to be sold off to the same developers who wanted to convert the West Side Market into this new Multi-million Dollar Development plan but the dioceses won’t sell now. The West Side Market building itself will be transformed into the squash courts, indoor tennis courts, running track and gym / yoga classes and whatever else will support the residents of the Ohio City/Tremont neighborhoods. Yes, it’s on the historical registry but as long as the exterior of the building and the structural layout is not changed, there is nothing to prevent developers from changing its use–not the structure. Want Proof that big changes are coming to that area? The Plaza on the southeast corner of W25th and Lorain where Key Bank and subway are in will be torn down and rebuild in the next year of so to better accommodate the future residents of the Townhouse Project by having stores that will better support residential housing rather than a Commercial Zone which it is now. Bye, Bye West Side Market and your 100+year tradition of being one of the last true market places in the nation. Ask Michael Cox and Councilman Cimperman how the plans are coming along! No paid parking. You want to increase customers, not drive them away. If you charged for parking, you would lose people driving in from the suburbs. Who would pay to park after driving 10 – 15 miles from home and shop? I would love to see the parking lot nearest the market put aside for HANDICAP PARKING!! There is not enough spaces for them. Have a special lot just for vendors therefore opening up parking spaces for customers. Also have the vendors clean up the space between the produce and meat building DURING business hours. Nothing like a good stench to make the air smelling good. Paid parking in inevitable, but there needs to be a free period, say 90 minutes. Without this you will drive suburban customers away or push them onto the residential streets. Paying $5 to shop at the market isn’t going to happen for a lot of people.